They undervalue their goods or services. They’re uncomfortable with giving their rates when approached about a project. They give me the runaround, which gives me (the client) too much to worry about, and so I find another person or solution because often, I have a strict deadline. I purchased a beautiful art print from a very talented artist two years ago. I had to send her a Direct Message through Instagram in order to purchase her art. None of her work was available on her website, although that’s what she was advertising on her social media. And when I inquired about the price, she wasn’t sure of what to quote me. She finally priced it at $60, and the piece arrived bent as if it was folded right down the middle. What a bummer! Similar artists( who are not black or female) have quoted me hundreds of dollars for comparable work. Their art is also available for sale on their websites with dimensions along with their terms and shipping policies. And they know how to pack and ship their work. Most recently, I tried to hire a black female photographer, and I’ve asked her about her rate on more than three occasions over the past few weeks, and I still haven’t gotten an answer. She had great questions, but she never replied with a rate. Same has happened with a few makeup artists. Typically, when I approached non-female or non-black photographers or makeup artists, they have a base half day/full day rate, along with some terms. They’re normally open to negotiate based on the project, but they’re always able to start with with some helpful information about their services. As a black creative entrepreneur, these encounters and exchanges hurt me immensely. It leads me to believe many things. That black female entrepreneurs are not confident to price their goods and services because they have the right don’t support system. Because like me, they’re probably self-taught, which means they don’t have access to the right information. Or that people often approach them to work for free or for very little in exchange for exposure. Or that people make them believe that their passion, talent, and hard work are nothing more than hobbies. And so they don’t take the time to really think about how to price or negotiate their work. I’ve never had a mentor, and I went head first into launching my first business. I don’t come from money so most of my big paid partnership work come from years and years of doing free work. I started by underpricing my products because I had no overhead cost or someone to advise me otherwise. I really wish I had someone to help guide me, but at lease I had the privilege to become my first teacher. I’m not terrified of going through the experiences, whether they’re good or bad. I’m also not terrified of failing. I have many interests and passions, and I told myself that if my projects fail (although I’ll work really hard so they don’t), I will be fine doing other fulfilling things. I promised myself that I would and could still be happy and live the colorful life that I deserve no matter what. With that said, I’m more than happy to share some of what I’ve learned in the past five years of entrepreneurship creating content for big, international brands, AND founding and growing my company Fanm Djanm. 1- Invest in yourself. If you don’t invest in yourself, why should anyone else? Take time and spend money to learn to do things the right way. Take the class or workshop. Upgrade that camera. Do your research. You become good at doing something by doing it often. And the best things take time. To some people, “I’ve made it”, and to me, I’m just getting started. Every chapter has its challenges, and you’re never too experienced to learn new things. There’s no shortcut to owning and operating a successful business. It takes time, patience, commitment, and a whole lot of reinventing yourself. 2- Know your worth. I know what you’re thinking… But how do I know my worth? Knowing your worth will come with time and experience. I still laugh at the time I only charged a few hundred bucks for a big project. Ha! But at that time, that’s truly what I was worth. I wasn’t investing enough time or money on my creative side. At that time, it was just a hobby or side thing. I had just gotten started, and although I was good, I didn’t know the ropes yet. Network and make friends with people who do similar work. And once you’ve gathered all of the necessary information, ask yourself the following: How long have you been doing this? Are you constantly booked? Do you get inquiries on a daily basis? How much time and work do you put into it? What value can you add to X project? What can you bring to X project that other people can’t? Do you have a voice? If so, what is it? Are you able to explain why your service or good is what it is without hesitation? 3- Turn down things that don’t and won’t serve you. I still take part in projects and make time to promote things I’m really passionate about for free. With that said, we all have bills to pay, and we like to splurge on shoes and makeup (and some of us are trying to start a scholarship fund for underprivileged kids in Haiti) so we can’t spend all of our time doing things that add no value to what we’re trying to accomplish. If you must show up for your friend or a random person who requires your skill and talent without pay, does that thing add anything to your portfolio or experience. Does it help foster relationships you need? Monetary value is not the only thing, but your time is worth SOMETHING. When you look at it ten years from now, will it make you cringe? Trust me, I have many many things that make me cringe now. But that’s ok! I’ll take the L, so you don’t have to. Sometimes, even if something pays big bucks, is it really worth promoting? Do you really want to add your name and likeness to something that harms the world or your community? 4- Support other entrepreneurs. It’s hard out there, folks! 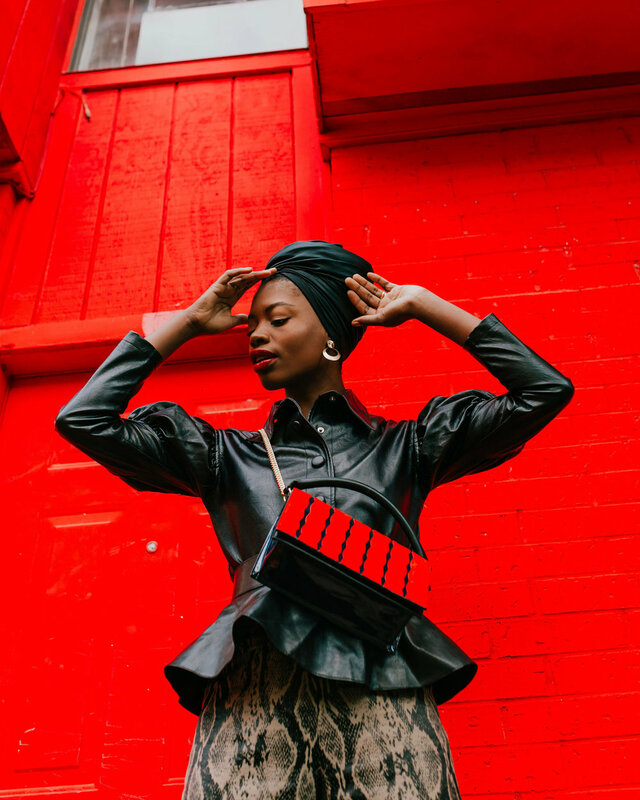 My company focuses on the headwrap, but we’re slowly growing into creating more accessories and clothing. That doesn’t mean I can support other designers. It doesn’t mean I should just copy what they do and have my seamstress work on it. It’s not fair. Success is not an individual achievement, it’s a community achievement. If you eat, make sure the people around you eat too. Also, try to collaborate with other entrepreneurs. For example, Coco and Breezy make dope sunglasses. I have a few pairs. So it only made sense to do a joint giveaway with them in honor of black history month. People who wear headwraps need sunglasses too. 5- Be firm. Be confident. Come up with a day rate or a set rate for various projects. Refer to tip ONE. Don’t let anyone tell you what you’re worth. Generally, I get messages like the following from brands: Hey Paola! (Insert BIG brand here) is releasing a new shoe and would like for you to help promote it. What is your rate for two instagram posts, two stories (2-3 frames each), link in bio for 24 hours and whitelisting access? All of these things I mentioned cost money on their own. So, I would quote them for my time, creative process, assets, and everything else they ask for. Link in bio for a brand means that my website gets pushed aside, and that’s potential work lost. Whitelisting means a wider reach for the brand, and so on… I generally only give them rights to digital use. Anything else cost more money. Oh, and never ever agree to unlimited, royalty free use unless they’re giving you an enormous check! If my rate is higher than the brand’s budget, I’ll either negotiate if I really like what they do or decline if I think they’re just a big company trying to take advantage of me. Just remember, brands/people don’t approach you because they want to do you a favor. They do because they see the value in you and your work. So know your worth, and be unapologetic about it. I hope these tips helped you. If you have any other questions or have anything else to add. Drop them below! This past weekend, I had to pleasure of speaking and displaying my company at South by Southwest’s International Women’s Day celebration in Austin, TX. It was one of the biggest events we had ever participated in so I wanted to make it special and to push myself to do something I had never done before. I designed my very first set and contracted artist and self proclaimed, modern day renaissance man, Moyo to help me bring it to life. I selected and hired two delightful, brilliant women (Alexandra and Cassie) to be the brand’s ambassadors, and I delivered a solo talk about building self confidence. It was a long twelve-hour work day, but I got to hug, meet, and celebrate so many amazing women. SXSW’s popup brought back memories of the very first time I displayed Fanm Djanm publicly. I laugh about it now because when I was selected to be a vendor at this little Harlem market, everything seemed so stressful and complicated to me then. I didn’t have a blueprint or someone to advise me on how to be properly display my work. I went into it with so much fear and anxiety. I paid fifty dollars for a vendor’s spot (back then, that was a big investment to me), and my goal was to at least sell two headwraps to cover the expenses. I remember packing a grey folding table, a container of about thirty headwraps, a couple styrofoam mannequin heads, a few baskets, and a tablecloth on my handy dandy little hand-truck. 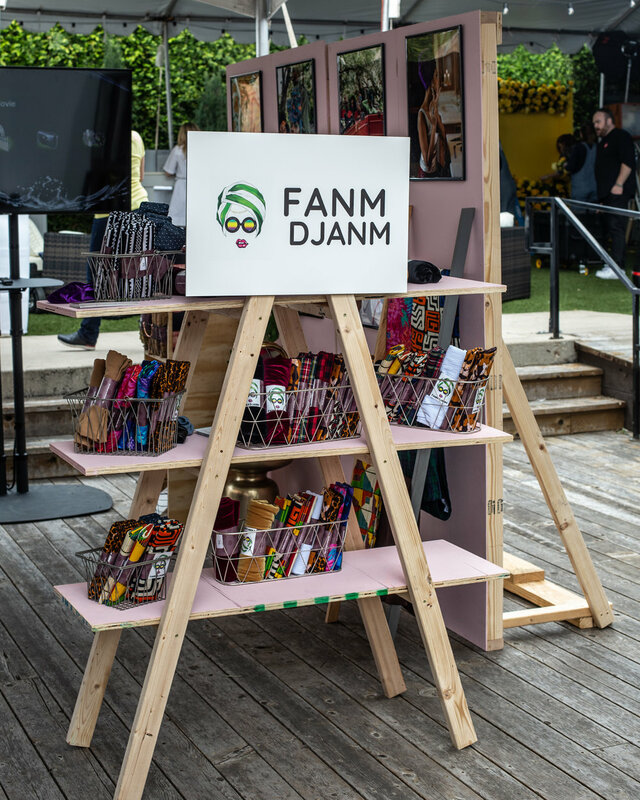 This was just a couple of months after I launched the Fanm Djanm website, and although I had been making sales online, I was nervous about displaying and talking about a product (that most people didn’t yet consider a product) to the general public. To get ready for the big day, I made sure I had enough inventory so to not disrupt any sales on the website. I made little price cards, a makeshift register with supplies I already had at home, and came up with a fun way to get people to buy more and sign up for the newsletter. I propped an old laptop on a colorful box on the small table that also served as product display and register to play tutorials (I had filmed of myself just a few days before in my tiny studio apartment) on loop. I looked all around me, I noticed how beautiful the other vendors’ sections were. Everyone seemed so much more experienced than me. My table was too crowded. Everything I did was so amateur compared to everyone else, but I decided to focus on my two strengths: my customer service and storytelling skills. If anyone passed by my table or made eye contact, I went around to greet them with a giant smile. And if they stopped, I’d tell them about my headwraps. I was so proud to talk about what Fanm Djanm meant and why I started it. I wrapped my first customer with excitement and a hint of timidness. I had never wrapped a stranger before, and I wanted the experience to be pleasant for the both us. The intimacy and spontaneity of the moment reduced my nervousness. I focused on the movements of my hands around her head and hair, trying to be as graceful as possible. I wrapped with intention, and as if my life depended on it. When I was done, I picked up the mirror to show her the results, waiting for some sort of uneasiness or criticism, but to my surprise, she squealed with joy. I turned around to find a small crowd around us. They were watching the entire thing, and one by one, they stepped closer to the table to pick out their headwraps and everyone wanted me to style them too. I wrapped each person based on their personal style, facial structure, and personality, and every time, their reactions would be similar to that of my first customer. Within a couple of hours, I looked around at the giant intimidating room filled with dozens of vendors’ tables and displays, and I was no longer afraid because my colorful headwraps lit up the room, standing out in the crowd. People were asking about what was happening. They had never seen so many women with headwraps before, and they wanted find the headwrap lady. All of a sudden, I had no more headwraps left, and the event still had a few hours to go. That afternoon was magical. I was very unsure and anxious about exhibiting my work at SXSW pop up too. My office is still in New York City. I’m in Austin without a team, and I was working on a few other projects. I didn’t want to bring a table and mannequin heads. I wanted to push myself to do something better. I knew my display wouldn’t be as fancy as the other more established brands I saw in the program, but I wanted to at least have something with character. Even if it wasn’t perfect, it would represent everything Fanm Djanm stands for. Overall, the SXSW popup cost me about $2300. That amount only covered supplies to build the set, the set builder’s fees, the ambassadors’ rates, photograph prints and mounted logo, props and baskets, uniforms (jumpsuits), transportation, food, and a handyman to deliver and put together the makeshift wall, and to break everything down once the event was over. The space was provided to us as part of my speaking contract. This does not include shipping a bunch of heavy headwraps and marketing materials from our NYC office. A few days before the event, I spent a few hours coming up with ideas for the display booth. I picked up supplies from Walmart and Home Depot. I planned out the day so my ladies didn’t feel tired and overworked. We started with breakfast at my house as I went over the day’s plans and my expectations. My true goals for the day were not to focus on sales, but to market, connect, and use this as a learning experience for future (similar) events. I know that my products cater to a niche market- most women of color (specifically black women), and I’m well aware that Austin lack diversity, but I still wanted to take advantage of the opportunity to present my work at such an important event. Sometimes, it’s important to understand when something will provide more value than just sales on a particular day. Looking back, I’m extremely pleased with how everything turned out. I realized how much work it takes to get everything to work. I love slow, difficult projects, and I’m getting giddy just at the thought of future events. Maybe five years from now, I will be able to afford an amazing team of florists and set designers. I’d have incredible acts and talent. But most of all, my hope is to be able to create unforgettable experiences.